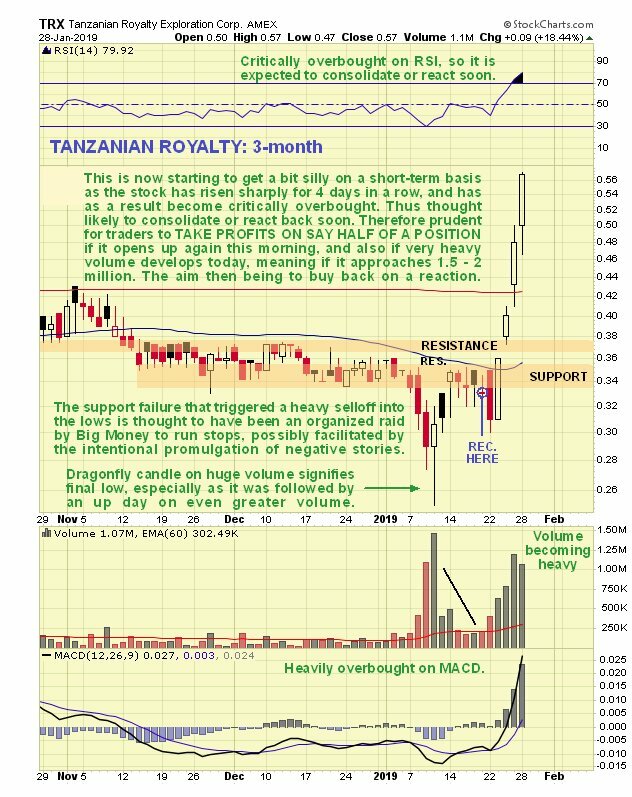 Tanzanian Royalty has gone up like a rocket since it was recommended on the site on the 20th, rising by 72% and, needless to say, it is now getting extremely overbought and due to stop to consolidate or react back some soon. Thus, if it should open up again today, it is thought prudent to take some money off the table here, say 50% of a holding and, in addition, if we should see very heavy turnover today, that is to say heading in the direction of 1.5 - 2 million shares traded, it will be a sign of short-term exhaustion, and also a signal to take partial profits, with the aim of buying back on a reaction. Longer-term the outlook for the company is excellent so investors may simply elect to ride out any correction. Tanzanian Royalty TRX, TNX.TSX, closed at $0.57, C$0.76 on 28th January. Posted at 8.45 am EST on 29th January 19.